April | 2016 | Boy Eats World! 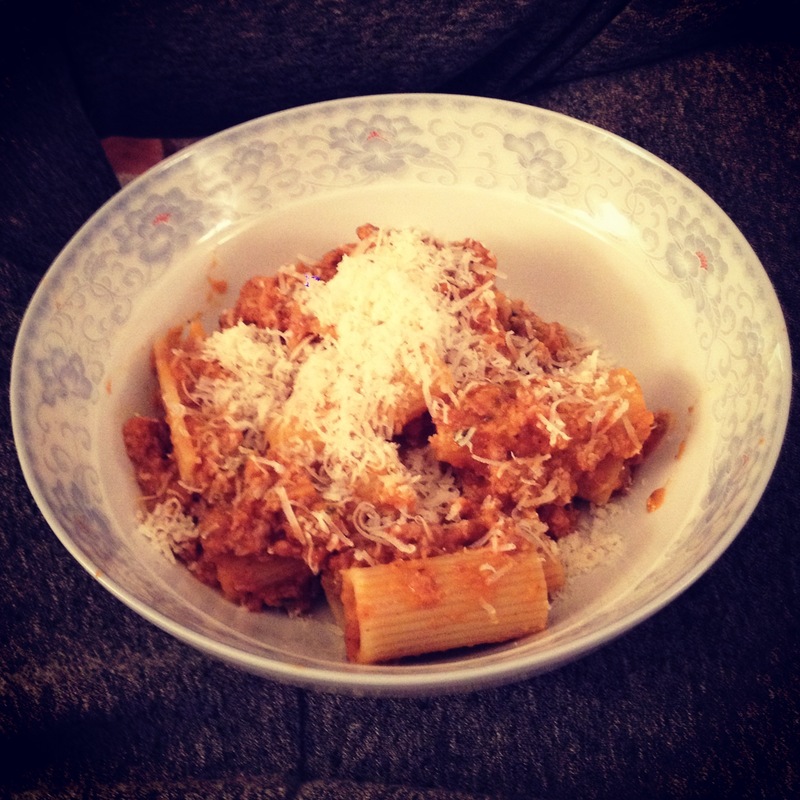 The final product: Rigatoni Bolognese – after lots of love and attention. Read my recipe story so you save yourself some effort! Your favorite pasta, reserve a cup of the pasta liquid if it’s dry pasta! I was at a Key Food store in Brooklyn, picking up pantry staples for my new place. You know, all those little things you need to (actually) cook food: Flour, honey, rice, vinegar, and so on. But I needed something to cook that night. With very limited kitchen functionality due to the move. I wanted something simple, with good flavor that would feed us for a few nights. Bolognese. Sadly, my new neighborhood Key Food market did not boast the best meat section. I went in thinking spicy pork ragu, but the sight of grayish, hardly marbled pig discouraged me. The most suitable pre-packed meat option was a trio of veal, beef, and pork. There was no fat ratio on the label. This was discouraging because this boy usually jumps for 80/20 exclusively. But If I wanted avoid another delivery from Shanghai Gardens… this was my only option. After lugging nearly $250 worth of groceries and pantry staples home, it was time to think. How do I make delicious Bolognese from this super sad super market meat? Unfortunately, due to the move, my options were quite limited. So I threw some veg in a food processor and starting thinking about the meat. I did what I always do, season, brown, break it up, but I could SEE how dry it was. 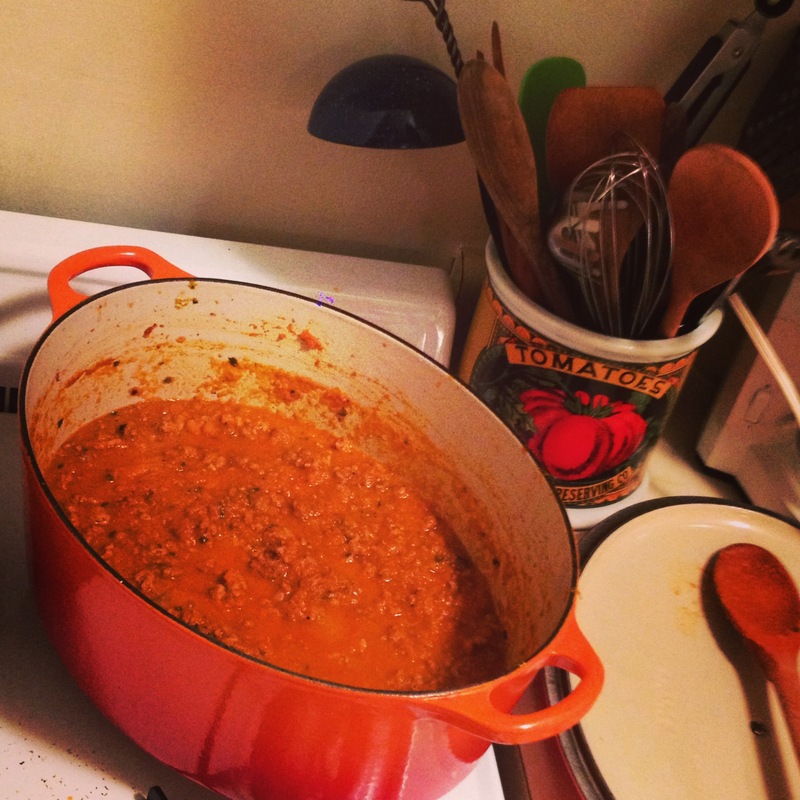 Normally, I add milk at the end of cooking my Bolognese (it’s just what people do). But I figured this needed the richness now so boom. Milk added, cooked into the meat then I removed it all into a dish to focus on my veg. How was I going to make this dish taste rich and decedent with every step? I decided on bacon and butter. I cooked up the veg with bacon, butter, and seasoned it all with red pepper flakes, salt and pepper. Then I cooked in some tomato paste and followed that with pureed San Marzano tomatoes. I cooked the fragrant tomato and veg mixture for a few minutes then re introduced our trio of meats. I added a pinch of salt, a dash of pepper, another little hit of pepper flakes, set the stove to a simmer and said a prayer. 2 hours later, the place smelled great. Sadly the Bolognese did not taste great. The seasoning was okay, but the meat was dry and the flavors weren’t melding. What was I going to do? VODKA! Drink it, yes, but also put a whole bunch of it in my sauce! I added about a 1/2 cup to cup of vodka to the Bolognese. I figured this would help break down fats and meat more, help the flavors mix and add depth to the sauce. Turns out, I was right! After another 30 or so minutes, I could tell the vodka was doing it’s magic. The sauce was beginning to to taste meaty. My final touch was another cup or so of whole milk. Once that cooked for another 30 minutes or so, a final touch of grated Parmesan Reggiano and I had made it to the end. Supermarket Bolognese. I strongly recommend starting with quality, high fat ground meats and sausage when you make Bolognese at home, but let’s face it, we don’t all have the money or resources to start there. So if you live near a Key Foods (or any chain supermarket) and have some time on Sunday, make Bolognese. But be prepared!!! I used Vodka but any booze would do. And make sure you have good fatty flavor enhancers like milk, cream, butter or lard around to substitute for the super lean meat to fat ratio.